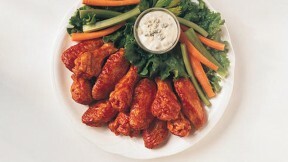 This is an ingenious way to have your wings but lose some of the fat. Boil wings in a large pot for 10 minutes. Drain water and excess fat when done. Mix equal parts hot sauce & BBQ sauce and toss wings to coat.